After hearing this saying in the movie, Sister Act 2, it inspired JT Adeline to push herself forward and make her dream a reality. 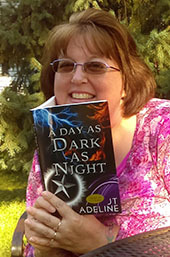 She is the author of A Day As Dark As Night, and A Day Without A Night, the first two books in The Dark As Night Trilogy. She is currently working on the third and final book to her trilogy; A Day Yet To Come. JT lives in Minnesota with her husband and two grown sons. If she is not writing, you can usually find her in her art room, spending time with family and friends, or outside with her beloved American Bulldog, Mylo. Stayed tuned for more exciting adventures coming your way!